Accounting is a social practice: it should be evaluated in terms of its contribution to a notion of social well-being. In order to do this, this book elaborates a critique of contemporary accounting. 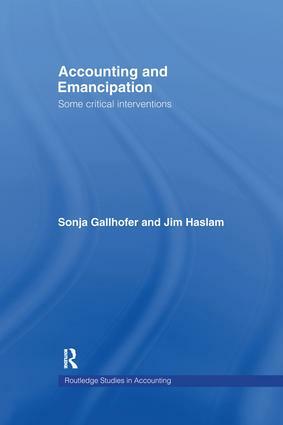 The authors encourage those with a close interest in accounting to make the search for a more emancipatory and enabling accounting a core area of their interest. The book will stimulate debate and activity in the arenas of education, research, practice and policy-making. Sonja Gallhofer is Professor of Critical Accounting at Glasgow Caledonian University and has published numerous critical, including feminist, historical, pedagogical and cultural, analyses of accounting. Jim Haslam is Professor of Accounting and Head of Accountancy and Finance at Heriot-Watt University, Edinburgh. He has published numerous articles contributing to the critical social analysis of accounting.